After growing by an estimated 2.6 percent in 2014, the global economy is projected to expand by 3 percent this year, 3.3 percent in 2016 and 3.2 percent in 2017 , predicts the Bank’s twice-yearly flagship. Developing countries grew by 4.4 percent in 2014 and are expected to edge up to 4.8 percent in 2015, strengthening to 5.3 and 5.4 percent in 2016 and 2017, respectively. Japan may be returning to 1990s style deflation. 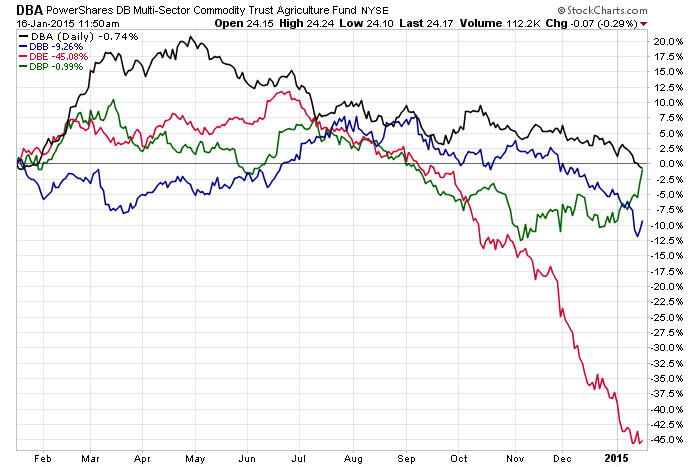 But there are also technical reasons for the various commodity market sell-offs. Saudi Arabia is clearly trying to drive out some of the more marginal US fracking companies in an attempt to regain control of the market. And Chinese hedge funds strategic selling of copper is at least partially behind the recent sell-off. In other words, supply and demand reasons underly the commodity market sell-off. The EU: for the last year, EU economic growth has been barely positive, nowhere near high enough to make a dent in its 11.5% unemployment rate. Industrial production is still far below its pre-recession levels and now with oil’s sharp price drop, inflation dropped .2% YOY in its latest printing. And despite record low interest rates and an ECB pledge to do “whatever it takes” to defend the euro, nothing has really changed for the regionl; its' still near 0% GDP growth. Russia: Russia derives are least 50% of its exports and government revenue from oil, meaning oil’s drop severely hurt the economy. The Russian central bank increased interest rates to 17% in an attempt to defend the ruble, but all this did was create a perception the bank was panicking. To make matters worse, the sanctions resulting from Russia’s invasion of Ukraine mean Russian companies don’t have access to western financial resources for refinancing. As a result of these two events, the ruble has dropped sharply, spiking inflation. Russia most assuredly faces a recession over the next few quarters. Japan: Despite Prime Minister Abe’s best efforts, the Japanese economy is in trouble. Although the BOJ successfully increased the monetary base to drive up inflation, the YOY rate of CPI increase is starting to decrease. The sales tax hike last spring sent the economy into a technical recession (two consecutive quarters of contraction). And, his program of structural reforms has been harder to implement than anticipated. Overall, the Japanese economy is not out of the deflationary woods. Australia: the unemployment rate has been ticking up for the last several years, rising from 5.6% at the beginning of 2013 to its current level of 6.1%. The most recent AIG business surveys of the services, manufacturing and construction sectors all showed fairly widespread weakness. But most of all, the economy is trying to pivot from one centered around raw material exports to China to one with a more varied basis for growth. However, this transition is extremely slow and hasn’t really been made yet. However, these gains will be more than reversed over time as lower incomes in the oil patch and along the supply chain spill over to the rest of the economy. The decline in Canada’s terms of trade will also reduce the country’s wealth. The lower prices, if they are expected to persist, will significantly discourage investment and exploration in the oil sector. As I mentioned earlier, we are already seeing signs of this. Lower oil prices are also typically accompanied by a weaker Canadian dollar, and this time is no exception. The dollar’s depreciation by over 10 per cent against the U.S. dollar in the past six months will help cushion the economy from the impact of lower oil prices. Despite the mitigating factors I enumerated, lower oil prices are likely, on the whole, to be bad for Canada. Estimating the magnitude of that overall impact requires carefully analyzing the interplay between the various effects as they work through the economy. That is what we are doing as we prepare next week’s forecast. The conclusion to draw from the above referenced notes is that large portions of the developed world (Australia, Canada the EU) are at minimum experiencing economic headwinds and others (Japan and Russia) are looking at potentially harsher economic realities. Traders have begun to include the potential for an economic slowdown in a number of regions in their economic calculations and are reacting accordingly. James Hamilton is my go-to oil analyst, and he has not disappointed. Over the course of several posts at his Econbrowser blog, he has noted a combination of factors behind oil’s price drop. He first references IEA information by noting the EU and Japanese slowdown are clearly effecting oil prices, as the demand curve for oil has lowered in the agencies most recent projection. But he also highlights the importance of US oil production, as it has clearly and meaningfully increased oil supplies. The importance of the shale oil industry is also spotlighted in this article on the website Enterprising Investor. The above analysis indicates that while demand has dropped, supply is the real problem. Chinese hedge funds, once again linked to a powerful sell-off in copper this week, were probably replaying an aggressive short-selling strategy they have also used to target iron ore and coal, according to industry sources. This indicates the growing clout of the secretive Chinese funds in global commodity markets as they tap their home-ground advantage in the world's biggest consumer of copper and other commodities. And, like the oil market, there is a problem with supply, as in there’s too much.